One of the biggest health risks as a person ages may seem silly to think about, for some; but for most elderly persons, the impact of losing firm footing and taking a fall can be severe. Falls are a big health concern in the United States; they can lead to severe injury, head trauma, physical pain, breaks, and even death. Furthermore, they are extremely common. The Centers for Disease Control and Prevention (CDC) reports that every year, one out of every three adults over the age of 65 takes a fall. Falls often go unreported, but among older adults, they are quite serious. They are the leading cause of both fatal and non-fatal injuries in seniors, with more than 21,000 dying from unintentional fall-related injuries. Over two million trips were made to emergency rooms in 2010 as a result of a fall. Preventing falls is extremely important and coming up with a solid defense/prevention plan can be rather complex. There is obviously a focus on physical strength and removing obstacles from the home, but defending yourself from a fall requires more than that. It’s also about keeping an active and engaged mind to increase awareness and send quick signals to your body. It’s not just your arms and legs that play a role. Your sense of touch is very important, too—but it must work in unison with the other parts of your sensory system. Your balance system requires a number of functions and senses to work optimally to keep you upright. Your inner ear, for example, senses head motions and plays a role in keeping you balanced. Your somatosensory system (sense of touch) makes you aware of objects around you and gives you the feeling of the ground beneath your feet, while your sense of sight allows you to see what’s coming and what’s immediately in your vicinity. All of these senses communicate with the brain to help plan and complete movements. Without a highly functioning, sharp brain, your risk for falls might increase. Establishing a mind/muscle connection could be what you need to help keep your feet firmly planted on the ground. Improving general cognition and creating a strong mind/muscle connection offers a number of benefits in addition to creating a defense from falling. You can improve your brain strength by keeping it active. Work on puzzles and brain games like crosswords or programs like “Lumosity.” Take a class and learn something new; engage with friends and find ways to keep your brain active. The mind/muscle connection can be established by including some physical activity that builds a relationship and strengthens the communication between muscle and mind. 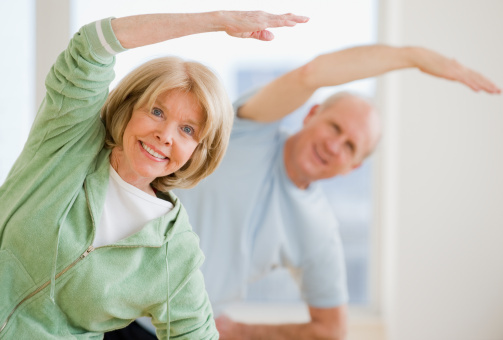 Tai chi, yoga, and strength training can all help establish and improve this connection. The slow, focused movements of tai chi and yoga force a person to hold movements and focus on feeling a certain area, while light resistance training works on strength and power so you can use force at a moment’s notice when required. When combined, these activities provide you with a great defense from falling. Having an active mind that’s in tune with your body keeps you sharp and aware of your surroundings, while creating fast interactions between your senses and limbs if they need to react quickly and provide the strength you need to stay upright. As you age, falling becomes a major health concern. Do your best to lower your risk by focusing on your body and mind. “Don’t Lose Your Balance,” Harvard Health Publications web site, April 5, 2014; http://www.health.harvard.edu/healthbeat/dont-lose-your-balance. “Falls Among Older Adults: A Review,” Centers for Disease Control and Prevention web site, September 20, 2013; http://www.cdc.gov/homeandrecreationalsafety/falls/adultfalls.html, last accessed April 17, 2014.